February is the month we celebrate love. Who deserves a declaration of love more than our four-legged best friends? While a box of chocolates, though loved by our human companions, is hazardous to dogs, and a dozen roses will just get a sniff, there are many ways to show our furry companions just how much we care. Here are 10 tips in “dog communication” to show our favorite dogs how much they are loved and adored. Take a quiet and calm moment, speak softly to your buddy, and maintain soft, lingering eye contact with him. This stimulates oxytocin in your pet and has a similar reaction as a mother/child bond. This is not time for a staring contest, but rather a loving, deep gaze. Note: This is only for those dogs you know very well. Direct eye contact will be a threat to other dogs. Dogs raise their eyebrows when greeted by their owners, so why not mimic their behavior? When you see your dog, raise your eyebrows (or just the left one, if you have the talent) and gently smile. Your fur baby will feel the dog love. Your dog may understand language more than originally believed, so chat away! Reading to dogs can help anxiety and shyness, especially dogs in shelters. Also, “listen” to your dog’s facial expressions, reactions and body language. The more you understand your dog, the better you can communicate with her. Taking a snooze next to your dog shows him affection and love. Dogs are most vulnerable when asleep, so this is a major display of love and trust. Even if you have a “no dogs in bed” rule, take a nap together on the couch, or have a cuddle on the floor before bedtime. While a big bear hug is not advised as it is threatening and stressful for many dogs, snuggling and close contact are ways to make your best friend feel loved, safe and secure. To dogs, leaning into you is a sign of love and trust. It’s a doggie hug! And you can gently give a leaning “hug” back, just be careful not to lean too crush nor corner your dog. Not only is the exercise good for both you and your four legged chum, but it also builds a bond between you. Spending time with your dog shows her in dog love that you care. Training builds trust and partnership. The more you can work with your dog and build skills, the better communication you will have. With positive reinforcement, your dog will work hard to make you happy. Gently rubbing behind your dog’s ears releases endorphins in your favorite pet. You will have one very happy, feeling loved dog! And don’t forget to pet your dog other places, too! Gentle grooming and massages are another way to show how you feel. Dogs have an uncanny ability to read our emotions and body language. If you are feeling love for them, and showing it, chances are they already know. Actions say a lot. Follow these tips, and your dog will feel important, safe and loved. 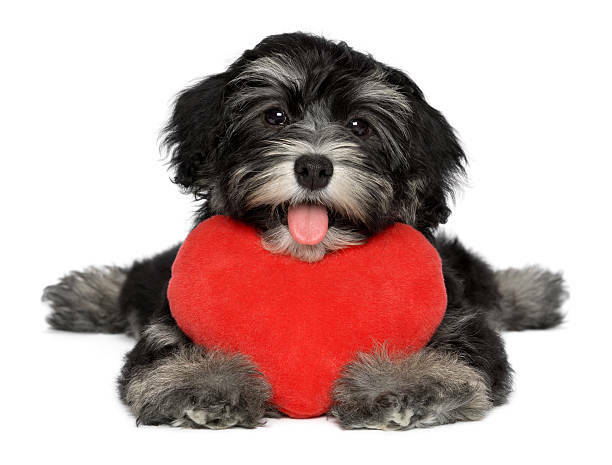 Happy Valentine’s Day from your friends at Breckinridge Park Animal Hospital! Breckinridge Park Animal Hospital serves the northeast Dallas suburban area including Richardson, Garland, Plano, Murphy, Wylie and Mesquite. This information is not a substitute for professional veterinary medical advice. Prior to starting any new treatment or questions regarding an animal’s medical condition, always seek the advice of your veterinarian.